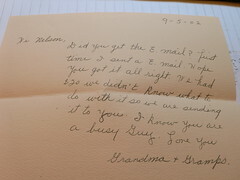 My grandma has written me hundreds of notes over the years, much like this one. The content of these notes is never terribly important, and there are far too many of them to keep conveniently in our overcrowded house. Nevertheless, I feel a twinge of guilt whenever I throw one out. I know that someday my grandparents will no longer be with us, and I will be sorry that I discarded these tokens of their affection. Therefore, we have a compromise: this note is getting recycled, but not before I preserve it digitally for posterity.